New Delhi, March 06, 2013. 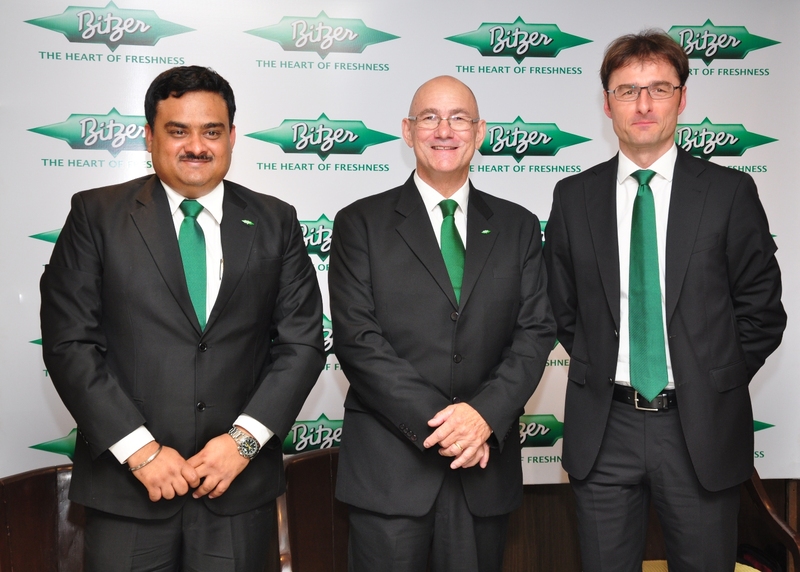 Bitzer, the worlds’ largest private compressor manufacturer has announced that it is expanding its operations in India. The BITZER Group is the world’s largest independent manufacturer of refrigeration compressors with sales companies and manufacturing facilities for reciprocating, screw and scroll compressors and pressure vessels all over the globe. Bitzer has been present in India since 2007 through a 100% owned Bitzer subsidiary - BITZER India Pvt. Ltd. It has developed an enviable reputation as a reliable supplier of its compression products to major OEM’s in India like Blue Star, Voltas, CIAT India, Climiveneta, Motherson Group, Panasonic India, Ingersoll Rand, Reynold India. In addition it serves clients like BPCL, Indian Oil, Reliance Industries, Maruti Suzuki, Taj Hotel, Hotel Leela, Radisson Hotel, Wal-Mart, Birla Retail, Reliance Energy, NTPC, Bharat Electronics , Indian Navy and Coast Guard through its offices in Mumbai and New Delhi. The activities primarily focus on customers support all aspects of application and systems design. Bitzer has a highly trained team of engineers to train and supports its clientele in the country. As a leading provider of compressors, Bitzer in India offers technical, commissioning and offers technically superior solutions to its customers. BITZER is globally known for manufacturing the most energy efficient products in its class and this makes it possible for its Indian customers to consume least possible energy, contributing to the country’s drive to reduce its energy and carbon footprint. According to Robert de Bruyn, Managing Director of Bitzer India, “ products manufactured by us are used for air-conditioning and refrigeration and find application in most of the industries. The process chillers made with our screw and reciprocating compressors are used extensively in power plants across the country. The central air conditioning plants in offices of major power companies would also have BITZER screw compressors. BITZER has supplied more than 30,000 compressors in India till date and these are working with hundreds of OEM’s and thousands of end customers across the country“. Now with a view to ready itself for the market which is anitcipate to experience exponential growth due to the envisaged setting up on the cold chain for the transportation and sale of agricultural products, as well as the opening up of foreign investment in retail, Bitzer plans to expand its owned & operated ‘Green Point’ Service Centres at Mumbai and Delhi to Bangalore (will be opened by April 2013). In addition, It will be having resident sales managers at Bangalore, Chennai and Kolkata. World wide companies like Wal-Mart, Carrefour, Metro Cash-n-Carry etc are all Bitzer customers and with the expected entry/ expantion of their footprints in the country, Bitzer expects that the demand for its cooling systems will go up many fold. With its recent acquisition of the truck and trailer refrigeration division of Lumikko, BITZER will start offering the product line to the Indian market, by mid this year. The demand for truck refrigeration is growing exponentially in India and is expected to grow over 20-25 percent each year and BITZER would be well placed to meet this demand with its energy efficient product range. According the Marcus Loistl, Bitzer’s Global Director Marketing and Communications, Bitzer does not have any manufacturing in India. All the products are sold in India are from its production factories at Germany and assembly plant at Indonesia. Bitzer has a two tier distribution network in India with distributors at New Delhi, Bangalore and Mumbai heavily stocking to ensure ex-stock availability from their pan India offices. They are complemented by L2 dealers based out of cities like Cochin, Kolkata, and Chandigarh etc.